With the world’s rhino increasingly threatened by the rapidly growing scourge of poaching, today’s World Rhino Day provides the ideal opportunity for companies such as &Beyond and Great Plains Conservation to celebrate the steps taken to protect these iconic animals. First initiated by the World Wildlife Fund for Nature (WWF) South Africa in 2010, World Rhino Day has since grown into a global phenomenon that has united NGOs, wildlife organisations, businesses and concerned individuals from around the world by encouraging them to create fundraising events for the species on 22 September each year. 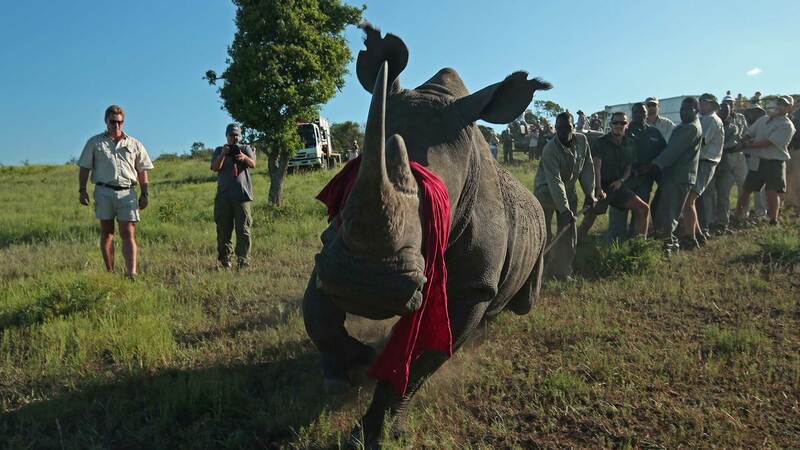 Believing that translocation is vital to the long-term preservation of the species, &Beyond joined forces with Great Plains Conservation to move rhino from high-risk areas in South Africa to neighbouring Botswana, a country that boasts an excellent anti-poaching record. With the project aiming to translocate 100 rhino, the first batch of animals has been successfully transported and released in Botswana earlier this year. In celebration of today and the success of our joint initiative, we are proud to announce that a brand new Rhinos Without Borders website has been launched on 22 September to coincide with World Rhino Day. Interested parties can log on www.rhinoswithoutborders.com from this date to keep up to date on exciting developments as well as find out how to financially support this project. While both &Beyond and Great Plains Conservation continue to raise funds for the Rhinos Without Borders project, both companies also aims to increase awareness of the plight of the rhino. We have thrown our weight behind the Inter-Schools Rhino Sculpture Challenge 2015, to be held at Cape Town’s V&A Waterfront on 22 September and ending on the 22nd October. Due to be launched by the Premier of the Western Cape, Helen Zille, the event includes the exhibition of life-size rhino sculptures passionately crafted by school children from eleven Cape Town schools. In a further show of solidarity for rhino conservation efforts, &Beyond Phinda Private Game Reserve Conservation Manager Simon Naylor will be speaking to over 5000 children on the topic of rhino conservation. &Beyond and Great Plains Conservation will be posting updates from the event on social media and invite all interested parties to follow the conversation efforts (#WorldRhinoDay, #Rhino, #Rhinos, #RhinosWithoutBorders).